Kickass Auto is the great cross of a Citrus and a very productive Ruderalis. The result if a very big yield in a short time and a very nice cannabis that will get you very high! 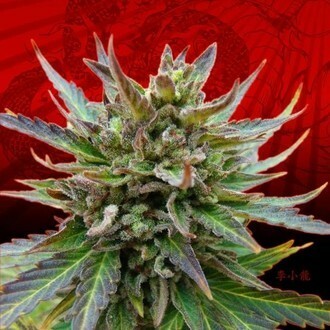 KANNABIA - B. LEE AUTO AKA KICKASS AUTO: Autoflowering psychoactive strain that knows how to reward you. Kickass Auto by Kannabia is the cross between a Citrus and a Ruderalis and is a really strong autoflowering variety. She really has a great way to combine the psychoactive characteristics of the Citrus and the production and speed of the Ruderalis. This strain is perfect for both indoors as well as outdoors as she can finish in only up to 65 days from seed to harvest. She grows in a nice and compact way both indoors as well as outdoors and develops thick stems with dense, orange nugs that are literally covered with resin. Kickass Auto is a great strain in so many ways. She is very generous and will reward you with a huge yield that has a perfect fruity smoke. Her high is very nice and soothes your brain with pleasure.